Last year we posted a "Publisher Q&A" series, featuring 12 short interviews with a range of publishers including Alec Soth, Shane Lavalette, Bryan Formhals, and Jason Fulford on their presses and the state of the publishing market (see the site links page for more links). It was a popular series, and we've decided to go ahead and add another 12 entries to the series with more extended questions. The first post of this new series was with Éanna de Fréine of The Velvet Cell, a London-based publisher of photography books. Today we follow with David Schoerner of Hassla Books. fototazo: What is the back-story on how Hassla formed? Was there a particular need in the industry that you saw and sought to fill? David Schoerner: Hassla began when I was in my final year of undergrad. I had been working at a magazine for a couple years, but was becoming more interested in the book form, particularly smaller artists books and catalogs. I started Hassla by first publishing a book of my own photographs and then began working with other artists. f: What are the particular or unique strengths of the books Hassla publishes? What separates it from other publishers? DS: The range of work we publish and artists we work with. f: What is your process for deciding what to publish? DS: Theres no real process. At the moment I don't take submissions, it comes from me seeing something somewhere, becoming interested and finding out more about the artist and work, and then approaching them to see if they'd like to work on something together. 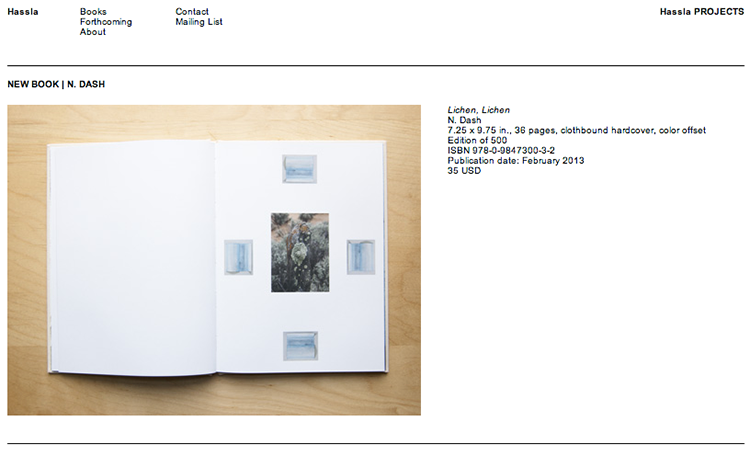 f: How do you view the contemporary landscape of photography books as a product and as a market in relation to the past? DS: Hassla began right at the start of what seems to have become a resurgence in the artist book and photo book. A lot of the books that are being produced today seem to be tied to the books artists were making back in the 60's and 70's. f: What do you believe are the strengths and inherent limitations of the photobook format, as opposed to showing photographs on a wall or in a digital or multi-media format? DS: Its just another way to view work. Some work fits better within a book form. The book allows the viewer to have a much more intimate relationship with the work through its tactile qualities. f: Is a photographer’s style, voice, or “sensibility” something equally apparent in their photobooks as in their images? DS: I don't know if its something thats equally apparent, but I do think an artist's sensibility is something that can come through in their books. f: What has been your highlight in working with the company? DS: Founding Hassla and slowly making it what it has become today. Also, having the opportunity to meet and work with so many amazing artists. It's always a great feeling when I reach out to an artist I'd like to work with and they say yes. f: What are your next steps for Hassla? DS: Keep publishing books. Hopefully, it will continue to grow and expand. We just released a new book with the artist N. Dash.